Rikhia: The Vision of a Sage, is compiled from the satsangs and enlightening informal talks given by Sri Swamiji Satyananda Saraswati in Rikhia from the time of his arrival there in 1989 until he attained maha samdhi on 5th December 2009. It presents Sri Swamiji's vision to fulfill the ultimate mandate God had given him, 'Take of your neighbours as I have taken care of you'. It was this mandate that led to a metamorphosis in Sri Swamiji's personality, way of life and destiny. It was a mandate that also began to transform the lives of thousands of Sri Swamiji's poverty –stricken neighbours living in the villages of Rikha panchayat. 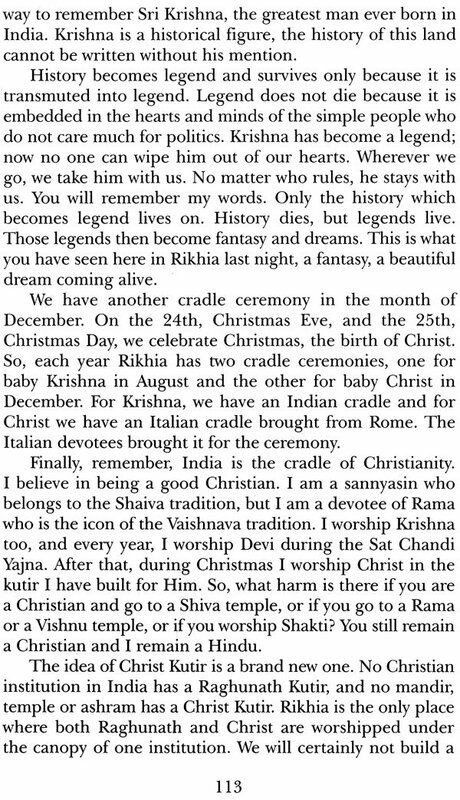 Rikhia : The Vision of a Sage illustrates how this great soul gave everything he had to fully realize his divine mission. This book is dedicated to the upliftment of Sri Swamiji's neighbours in Rikhia and to the fulfilment of his pledge to them, to make Rikhia 'green and prosperous'. In August 1988, after leaving Bihar School of Yoga in Munger and travelling to the holy places throughout India, Sri Swami Satyananda Saraswati finally arrived in Tryambakeshwar, near Nasik, to spend the monsoon rains in seclusion. There, on 14th July 1989, he sought darshan of his ishta deva, Mahamrityunjaya. Prostrating before his ishta, Sri Swami ji surrendered everything: the work, responsibilities, friends, disciples, money and all accomplishments that related to his mission to spread the message of yoga throughout the world. He now sought guidence from God as to what he should do next, and he promised, "Hereafter, I will do whatever You tell me. I will not to do anything on my own." A few months later, Sri Swamiji received a clear instruction from God that he was to go to Sati's cremation ground in Rikhia, near Deoghar. Following this command he arrived in Rikhia in September 1989, and settling into his new adobe he began to perform intense austerities, exemplifying the highest principles of the Sannyasa tradition. He received the ultimate mandate from God in 1991: "Take care of your neighbours as I have taken care of you." This led to a metamorphosis in his personality, his way of life and his destiny. Sri Swamiji changed his teaching and his way of thinking. He became the servant of God and hence forth was shown a spiritual path that would transform the lives of thousands of poverty –stricken villagers in Rikhia panchayat. When Sri Swamiji first came to Rikhia, the area was desolate; there was nothing growing, not even a tree, shrub or brush. The conditions of the village people around him were pitiable. Many had nothing to eat and many more were suffering from malnutition. The elderly, the blind, the sick, the disabled and widowed were all in grave need of assistance. There were no proper housing or drinking water facilities in the villages. No basic services for healthcare, electricity, transport, roads or telephones. Facilities for education were minimal and of the lowest standard. Illiteracy was a big problem, with no inspiration to overcome it. The villagers had no alternative but no live a life of deprivation and their future looked abysmal: scarcity, suffering, poverty, darkness and dejection. Nothing else. However; Sri Swamiji changed it all. Rikhia: vision of a Sage is a compilation of the satsangs and informal talks given by Sri Swami Satyananda Saraswati in Rikhia from the time of his arrival there in 1989 until his Mahasamadhi on 5th December 2009. It shows how this great soul gave everything he had to fulfil the mandate God had given him, to care for his neighbours. It is a detailed account of how Sri Swamiji transformed the very existence of his village neighbours by distribution of prasad, the fruit of his sadhnas. 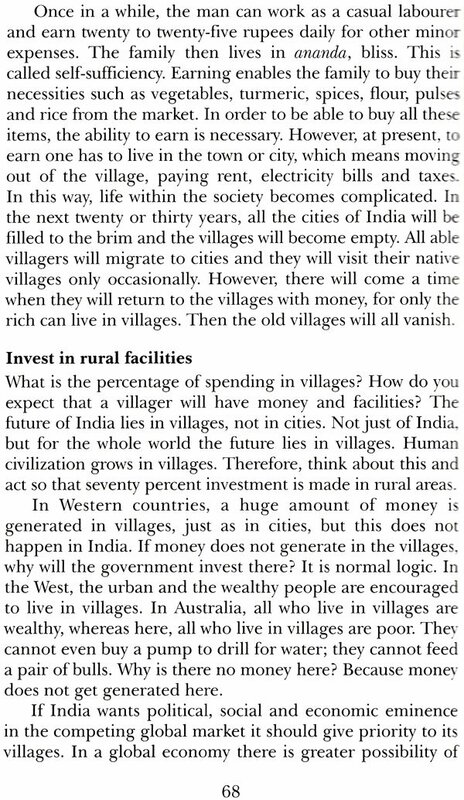 Sri Swamiji makes it very clear that the economic, social and spiritual prosperity he brought to his neighbouring villages came not through charity or social service. Whatever was distributed, the cows and bulls; cycle rickshaws and handcrafts; education, bicycles, stationery and games for children; food, clothes, blankets, houses and household items; education, bicycles, stationery and games for children; food, clothes, blankets, houses and household items; sewing machines, construction and farming tools, good quality vegetable seeds, umbrellas and hurricane lanterns, all was first offered to God as a form of worship, and then given to the recipients in his name. We read how Sri Swamiji ensured that the village recipients received their prasad in a correct and orderly manner. He was adamant that everything he offered to the villagers in the form of prasad should have some practical purpose, to help people according to their need. He taught that if things were simply distributed in the villages as handouts it would not make any significient difference in the long run. Their poverty would be a curse, because they themselves would not be doing anything constructive to eradicate their adversity. In his words of wisdoms, "To help people, you should make them self –sufficient; give them an opportunity to build their skills; give them auto-rickshaws and teach them to drive so they can earn somes rupees daily to at least feed their family." This book illustrates how, thorough Sri Swamiji's enlightened guidance, the village developmental work, under the auspicious of Sivananda Math, enabled the villagers to foster and improve their own strengths and abilities. 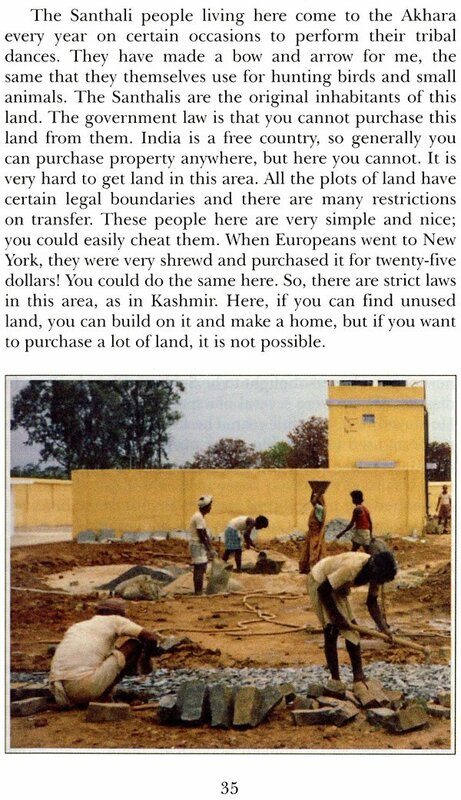 Sivananda Math a way that the recipient of each house not only felt responsible for the construction, but was also paid for his contribution to the building work. Each year on his guru's birthday a villager was helped by Sri Swamiji to establish a small bussiness or enterprise which would generate a means of earnings in that family and at the same time provide a service to the local community. Cows were given as prasad to hundreds of families, but each household was required to send a representative to the Akhara for through training in caring for the cow before it became part of their family. 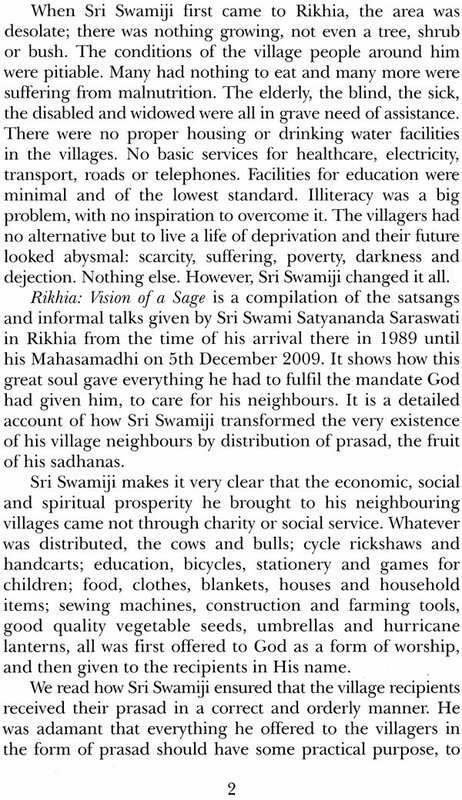 Rikihia: the vision of a Sage presents many more examples of how the villagers were encouraged by Sri Swamiji to help themselves. Within these pages there is alos the treasure trove of inspirational spiritual teaching that came through Sri Swamiji during the period of his austere were founded on what his own guru, Swami Sivananda, had always emhasized, 'Serve, love and give': that selfless service is the emphasized, 'serve, love and give'; that selfless service is the stepping stone into spiritual life and the realization of divinity in every aspect of creation. The wisdom he gave was to help us understand that until we are able to provide the basic needs of life to those who do not have them, there is no meaning to our religion, politics, national laws or our spiritually. He talks about compassion and sympathy and the necessity for every spiritual aspirant to have these qualities in their heart, for without them, no sadhna will be successful. In fact without them, sadhana will be useless. In his satsangs, Sri Swamiji gave the sadhana of atmabhava to all. He wanted everyone to be capable of feeling 'oneness with other beings'; to be able to identify with their suffering and also with their happiness. He wanted those who were part of his mission to be able to find a way to serve and uplift the poor. In his words, "Do not make plans only on paper, implement them and keep them active in the villages." As a means to put these teachings into practice, he conducted the grand annual yajnas, Sat Chandi Mahayojna and Yoga Poornima. His special guests at each and every yajna were, of course, his neighbours and he always honoured their presence with special acknowledgements. 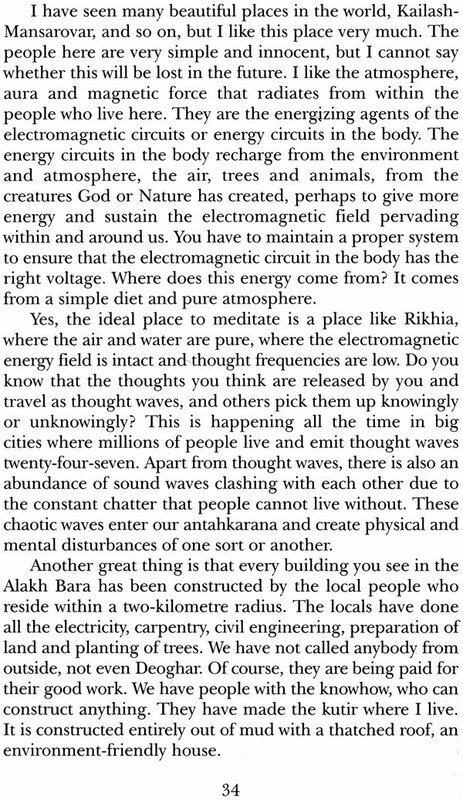 The various chapter of the book introduce Sri Swamiji's neighbours, give a feeling for the enviroment in which they live, and offer his higher perspectives on a variety of topics related to their plight: poverty, education, health and marriage. We share his pride and joy as he describes them as 'embodiments of love'; and they equally adore and worship him. We feel the respect he held for the village widows, and the understanding he had for his 'co –travellers', the old retired men of the area. However, it is apparent that the village girls and women capture the biggest place in Sri Swamiji's heart, as we read how the grand annual wedding celeberations of Sita Kalyanam were organized by Sri Swamiji primiarily to ensure their welfare. He considered women the treasure of society, recognizing and promoting their needs for stablity, strength and rulership. We learn how Sri Swamiji was ready to offer every form of assistance and opporutnities to encourage the village girls and women to express their potential, to empower their personalities, and to give them a voice in modern society. One way he did this was to set before them a finr example of a modern women who could shoulder heavy resposiblities of management, planning and administration –Swamiji Satsangi. We read of Swamiji's praise of her abilites to organize the village develoment work in highly organized, methodical manner, exactly as he had envisioned. He describes her thus, "she has become an asset for the people here and they like her... Initially I used to tell her what to do, but now. Of Course, after me she will carry on the work of Sivananda Math very well..."
There is no doubt that impressive changes have taken place in Rikhia under the care of Sri Swamiji during the twenty years of his physical presence. Today, Rikhia is slowly entering the 21st century with Pcos, mobile networks, satellite connections, cybercafes, internet, shops and traffic. The children the attend classeds at the Akhara, learning computer skills and English. They chant in impeccable Sanskrit and have developed many other talents. Some of the girls go to Deoghar to study in college. The change is apparent. The parents have also undergone a transformation. They are comfortable and happy, not in desperate need as they were when Sri Swamiji arrived in 1989. We offer this book to illustrate how good work for humanity is possible when people share their wealth, knowledge and skills. Whatever I have, whatever I can manage, I will consecrate to them during my lifetime and even after that. This is a trial project that will improve the area. In the course of time I can see very clearly that thousands of young, brilliant, fresh, enthusiastic, energetic boys and girls will take up work throughout the rural sectors of India. They will go to each villages and live and work with the village people for their upfilment. Note: Rikhia was within the state of Bihar until the nineties. It came under the jurisdiction of Jharkhand when this new state was created.